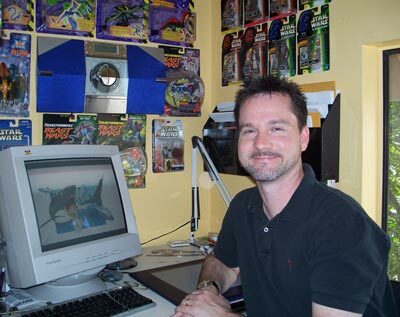 Tim Bradley, a freelance designer who worked with Hasbro for the Chaos Effect and the Jurassic Park 3 lines, was kind enough to give us a great insight of the production of the Jurassic Park toy line. It is truly a great pleasure and honor for us to have been able to get in touch with someone so passionate about what he does, and still accessible enough to agree to be interviewed by us fans. Tim Bradley: First, I should clarify my involvement with the Jurassic Park toy line. I worked on Chaos Effect as a freelancer, before I was a staff artist for Hasbro (in the former Kenner facility in Cincinnati). While I was a full-time product designer for Hasbro, I was on the Star Wars and Transformers teams, and spent some time on the Special Projects team, as well. After I left Hasbro and returned to California, shortly before the Cincinnati facility was closed, I freelanced again for Hasbro, on concepts relating to Jurassic Park 3, and again for some early concepts for Jurassic Park 4. I was actually never on the JP team in my time at Hasbro, so I can’t answer some of your questions about specific products that were developed but not produced for the various JP lines. JPToys: Could we know more about the general production process of Jurassic Park action figures? How does that work exactly? A license is obtained, then what? You get to see bits of the movie and base your ideas directly off that? Or do the designers just sit around the table, coming up with random dinosaur, vehicle and action figure ideas? Well, I can tell you about how things have gone as far as the projects I have been involved in. For Chaos Effect, I know that the aim was to create an animated JP-related series (I think the concept may have been developed in-house at Hasbro). I had sent samples of my dinosaur art to Hasbro (knowing that they had the JP license), and I received a call from them asking if I would be interested in generating some sketches. I did some quick pencil sketches of what the design brief called for: weird hybrid dinosaurs. Since they would be animated, I could selectively exaggerate the physical characteristics of the creatures. I did a series of sketches that mixed Archaeopteryx and Velociraptor to varying degrees, and one of those sketches was approved by Hasbro. For my concepts on Jurassic Park 3, I was given some specific scenes from the movie script, and I was asked to produce some line drawings that illustrated them. These mostly had to do with the fight between the T. rex and Spinosaurus. For Jurassic Park 4, I did some really preliminary creature explorations, but I think the ideas were just “blue sky” at that stage. I don’t think I can comment on them at present, beyond saying that I’d be surprised if the story hadn’t changed pretty radically since I produced those drawings. That was a few years ago. I had a good time working on it, as always. We heard that for the Jurassic Park toys, Kenner/Hasbro used the pre-production drawings and storyboard sketches for the movies, and even for the first Jurassic Park line, they colored some dinos with their novel counterpart's description. So, the toys and the movie can be released at the same time, but it makes most of the figures aren't really accurate to the movie characters. Now, if Jurassic Park toy lines were produced like that, how come other movie toy lines (Star Wars prequels, Spider-Man movies, Transformers, etc) can be produced with more detailed accuracy and look more like the actual characters in the movies, and yet they can still be released with the movies at the same time? I can’t say specifically why some colors were chosen, and not others in the JP line—as I mentioned previously, my experience with the JP lines was confined to concept work on Chaos Effect, JP3, and JP4. With my experience in other movie/TV-related lines like Transformers or Star Wars, what usually happens is that the toys and movie are being produced pretty much simultaneously. If someone on the movie production decides to make a last-minute color change to a character or vehicle, it may be too late to make that change to a toy, unless a production change partway through the toy’s release is possible. That may have been the case with JP toys—I don’t think it’s too uncommon. We heard a rumour that there was a plan for Kenner to produce a massive Brachiosaur toy for the first Jurassic Park line. Is it true? Couldn’t say, but that would have been cool, wouldn’t it? Brachiosaurs are awesome. On the back of the boxes and cards of several Jurassic Park lines, we get to see pictures of toys that were never released to the general public (The Lost World Triceratops, Chaos Effect Ultimasaurus, Scrap Davis, etc.). Do you know why these made it past the design and prototype stage but were eventually never seen in stores? Again, I can’t really say—I wasn’t a staffer at the time those decisions were made. In the case of Chaos Effect, it may have been driven by the fact that the animated show wasn’t produced, and the word about the toy line just didn’t get out there. From what I had heard, the line actually did pretty respectfully, without any kind or program support. Why was that awesome adult Triceratops from The Lost World never released? If Hasbro still got the mold, is it possible that we might see it in the future JP line? I’m not familiar with that product, but if there is a way in the future that the mold could be used, maybe it will happen. Sometimes, products get partway through the production cycle, but a decision is made to hold off on it. But, I’ve seen toys that were produced, then cancelled, brought back to life again, so you never know. A Chaos Effect presentation book was recently sold on eBay. Considering you got a spot in Hasbro's design staff after showing them dinosaurs illustrations for that series, do you recognize some of the drawings in that book? Those are my color drawings of the dinosaurs, and I think the black and white line art of the Compstegnathus is also mine (it’s a little blurry-looking, but I did the turnarounds for that creature). That was before I started producing my art digitally. You can see some of my more recent dinosaur art on the Jurassic Park Institute Dinopedia on Yahoo. I also have a couple of kid’s books out: Paleo Sharks and Paleo Bugs (due out in April) that have digital art in them. I still use pretty bright colors, since those kind of bright colors and bold patterns are found in nature very often. Dr. Bob Bakker reviewed almost all the illustrations for the JPI Dinopedia, and he was actually very supportive of my use of color, which was great to hear. Do you remember some concepts for the Chaos Effect series that weren't used for the final line (Ultimasaurus,...)? 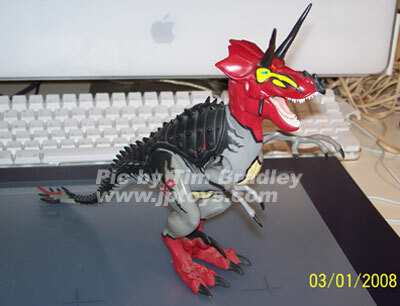 Some samples of the Ultimasaurus were produced—when I moved up to the Transformers team, one of the engineers sitting near me had a couple of Ultimasaurs on his desk, and he was nice enough to give me a painted one. I had done the turnarounds for that one, and the color drawing, and the finished toy stuck really closely to my drawings. As far as other concepts, yikes! I sketched out a huge number of sketches, but none of them really stands out to me. My favorites were the ones that actually got produced—Velociraptoryx, Amargospinus, Compstegnathus, Tanaconda, Ankyloranodon, Paradeinonychus. Some illustrations for the Chaos Effect line made by designer Brian Eun surfaced years ago. Do you remember working with him? I think Brian was a staffer at that time, and I was still working as a freelancer from California, but I have seen a bunch of his sketches—he does awesome stuff! He brought a great aesthetic to the line. The Chaos Effect line was supposed to be released along with a cartoon. Do you know how far that cartoon went in development, and why it was abandoned? I think it went pretty far—up to meetings that included Steven Spielberg, I believe. I’m not sure why the decision was made to ultimately not produce the series, but Hasbro had already started work on the toys, and they decided to continue on ahead. Any info about the Night Hunter Series? We know that the JP: Dinosaurs line released in 1999 was basically a replacement for that cancelled series, but could you shed some light about why that glowing-in-the-dark concept was dropped? No, I don’t have any information about the Night Hunter series. What are your thoughts on the JP: Dinosaurs repaint lines? Good, not good? Sure, I think they’re great—anything to keep the line going. There’s always going to be kids interested in dinosaurs, even if the movies are a few years apart. Some of the color combinations have been really great, too. It's great to know that you were the one who suggested a Tapejara for the JP3 line. But considering this one was basically a retooled Pteranodon, was your original concept different from the released product? And did you have ideas for other dinosaurs that didn't appeared in the movies to be included in the JP3 toy line? My drawings for the Tapejara would have been different proportionally from the Pteranodon, since Tapejara is a much smaller pterosaur. But, a toy company really has to weigh whether producing all new tooling for a similar product is worth the expenditure, and in that case, I understand why the re-used the Pteranodon body. Can you tell us something about JP3 toys that never got released? 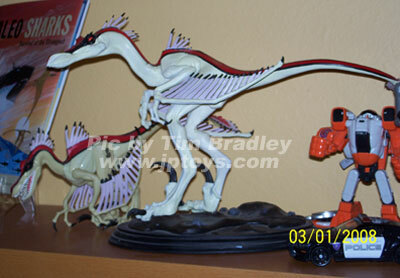 No, I don’t have any information about JP3 toys that didn’t get released, unfortunately. What was the deciding factor of the scale of the JP/// toys? Almost all the dinosaurs were around the same size, there seemed to be little consistency between each figure. I wasn’t at Hasbro when those decisions were made, but I think it may have been a playability issue—the dinosaurs may have been made around the same size so they could battle each other. I'm always wondering why are all of the JP/// dinosaurs eternally wounded? I think that would also have been a playability-related thing. You could really make your dinos rip each other apart! What are your thoughts on the difference in style between Hasbro's and Kenner's Jurassic Park lines? Do you prefer one above the other? Well, I’m a bit biased, I think—I had so much fun working on the Chaos Effect line, and coming up with those wild color schemes. The sculpts were really great, and captured what would have been a wild cartoon series. I know that Chaos Effect is a bit controversial, since it’s more fantasy-driven, but it’s really fun, I think. You chipped a lot of ideas for the JP4 line back in 2004. Could you give us an idea of what kind of concepts you had for that line (dinosaurs with guns, as an early storyboard revealed)? Wow, I hadn’t heard of the dinosaurs with guns thing. The sort of thing I explored with my sketches had to do with pushing certain aspects of the dinosaurs to make them look more aggressive and vicious. The storyline was pretty amorphous at that point, as far as I understood. What are the deciding factors on the accuracy of the toys to its movie counterpart? If a new Jurassic Park line were to be made, whether JP4 or something else (anniversary series? ), do you think the sculpts and paint jobs would be more life-like and movie accurate? It really depends on who the line is for, and what the movie or show was like. The first JP movie brought a lot of the science into it (as the book did), and the CG and animatronic dinos in the film were very realistic, so it was important for the toys to reflect that, and stick pretty closely to the film where possible. For Chaos Effect, that would have been more like the Star Wars “Clone Wars” cartoons, where the visual style was very exaggerated, and colors were pushed a lot farther than they would have been for one of the JP films. The Chaos Effect line was aimed squarely at young kids, so the sculpts and colors were really dynamic, and the emphasis on being scientifically accurate wasn’t really a factor, as far as I was concerned. As you might know, Sideshow Collectibles recently showed a JP diorama with a recreation of the first movie's final scene. Would you have liked to work on this statue, or any other that Sideshow would be planning? Realistically, they wouldn’t have needed someone with my particular skills for a project like that—there are most likely so many photos of that scene, and of the dinos in it, that you wouldn’t really need a concept artist. However, it would have been a fun project to work on, I’m sure! Do you have any interesting prototypes or unreleased models you kept? I mentioned the Ultimasaurus given to me by one of the Hasbro engineers who worked on the line. I was also given a large maquette of the Chaos Effect Velocirapteryx, which is really beautiful—painted in the same colors as my drawing, and of the actual toy. That is one of my most prized possessions! Which action figure you designed for the various Jurassic Park lines you worked on you're most proud of? I would say the Velocirapteryx for Chaos Effect—I know that the line was somewhat controversial, but it was really a blast to work on—I had a pretty free hand to experiment with proportions and colors, and that’s really fun to be able to do. The Velocirapteryx has such an iconic look to me, that symbolized what the line was about. Furthermore, what is your favorite Jurassic Park (or The Lost World/Chaos Effect/JP3) toy, and why? I don’t know that I would be able to pick a favorite segment of JP—they all have their own identity. I like the fact that the designers ended up bringing some of the less well-known creatures into the line—I think that would have been really fun for kids, and would really keep the line fresh, plus it keeps the science in the line, to a certain extent. I think one JP toy that I really thought was an awesome idea was the “dinosaur medical lab” set, with a lot of medical equipment, and an Allosaurus. I would have loved that one when I was a kid. You seem very interested in prehistoric animals not widely known to the public. Don't you regret not seeing more of them in the JP toy line (apart from a handful like the Scutosaurus, the Estemmenosuchus or the Tanystropheus that were released)? Yeah—I understand why it was done (those types of decisions are usually marketing-driven), but it really would have been fun to see how far the line could have expanded. Remember in the first JP movie where Nedry is lifting the embryos? The little carousel that the embryo test tubes are on had some other dinos that don’t appear in the film. The one that sticks in my mind is Metriacanthosaurus, which was a pretty cool predator, similar in some ways to Allosaurus. That guy would have been an awesome figure. Now, the fun question. Let's imagine Hasbro gives you free reign for a new JP: Institute line, with, let's say, 8 spots for small sized animals, 4 medium ones and 2 big ones. Which ones would you choose for this dream toy line? I think that might be a fun line! We thank you, Mr. Bradley, for taking the time to answer our many questions, and for your kindness. And to our visitors, make sure to check out Tim Bradley's great website, and of course, to take a look as his published books, such as Care & Feeding Of Dinosaurs, Paleo Sharks: Survival of the Strangest, or the upcoming Paleo Bugs: Survival of the Creepiest (release date: April 16, 2008). DISCLAIMER: While we understand the enthusiasm of our readers for this interview, please refrain from contacting the interviewees on behalf of JPToys. The people interviewed do this as a favor to JPToys and are generally taking time off of their busy schedules. They do not have the time to answer dozens of e-mails. If you have any questions regarding the interview, please contact JPToys.com staff. They will be happy to answer your questions, or centralize them and then contact the interviewee. This interview is © 2011 JPToys.com and Tim Bradley. The pictures are © Tim Bradley.